Our annual Your State Parks Day – Friends biggest volunteer day of the year – is Saturday, September 30th. FREE admission for all volunteers. Come help us Celebrate Georgia and all her beautiful historical and cultural beauty! Each of your parks and historic sites have carefully chosen special projects that are most needed to address various preservation and beautification efforts of these sites. 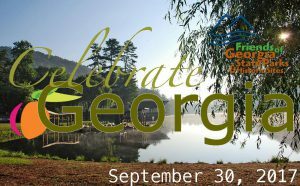 We welcome you to join Friends volunteers and partner with site staff as we Celebrate Georgia Saturday, September 30th! For more information, visit gastateparks.org. Posted in State Parks. This entry was tagged Georgia State Parks, health, state park, volunteer. Bookmark the permalink.